حاج حیدری, حسام, میردامادی, حمیدرضا. (1392). فرمول‌بندی و آنالیز ارتعاشی ورق‌های چندلایه‌ی متقارن عمودچین نوع لوی با روش المان محدود طیفی. نشریه پژوهشی مهندسی مکانیک ایران, 15(1), 21-35. حسام حاج حیدری; حمیدرضا میردامادی. "فرمول‌بندی و آنالیز ارتعاشی ورق‌های چندلایه‌ی متقارن عمودچین نوع لوی با روش المان محدود طیفی". نشریه پژوهشی مهندسی مکانیک ایران, 15, 1, 1392, 21-35. حاج حیدری, حسام, میردامادی, حمیدرضا. (1392). 'فرمول‌بندی و آنالیز ارتعاشی ورق‌های چندلایه‌ی متقارن عمودچین نوع لوی با روش المان محدود طیفی', نشریه پژوهشی مهندسی مکانیک ایران, 15(1), pp. 21-35. حاج حیدری, حسام, میردامادی, حمیدرضا. فرمول‌بندی و آنالیز ارتعاشی ورق‌های چندلایه‌ی متقارن عمودچین نوع لوی با روش المان محدود طیفی. نشریه پژوهشی مهندسی مکانیک ایران, 1392; 15(1): 21-35. Leissa, A.W., "Advances in Vibration, Buckling and Postbuckling Studies on Composite Plates", Composite and Structures, Vol. 63, pp. 312-334, (1981). Reddy, J.N., "A Review of the Literature on Finite Element Modeling of Laminated Composite Plates", Shock Vibration Digest, Vol. 17, pp. 3-8, (1985). Kapania, R.K., and Raciti, S., "Recent Advances in Analysis of Laminated Beams and Plates, Part II: Vibrations and Wave Propagation", Shock Vibration Digest, Vol. 27, pp. 935-946, (1989). Doyle, J.F., "A Spectrally Formulated Finite Element for Longitudinal Wave Propagation", International Journal of Analytical and Experimental Modal Analysis, Vol. 3, pp. 1-5, (1988). Doyle, J.F., "Wave Propagation in Structures", Springer-verlag, New York, (1989). Doyle, J.F., and Farris, T.N., "A Spectrally Formulated Finite Element for Flexural Wave Propagation in Beams", International Journal of Analytical and Experimental Modal Analysis, Vol. 5, pp.99-107, (1990). 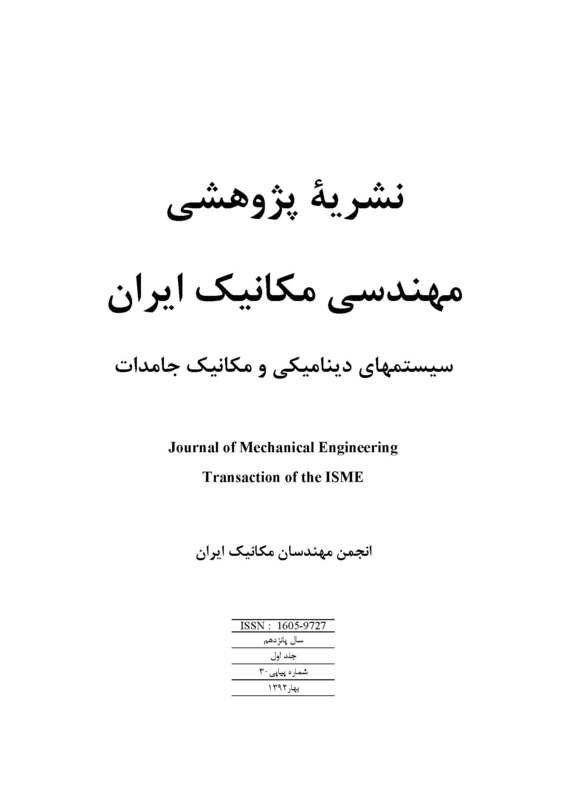 Lee, U., and Lee, J., "Vibration Analysis of the Plate Subject to Distributed Dynamic Loads by using Spectral Element Method", KSME International Journal, Vol. 12, pp. 565-571, (1998). Lee, U., and Lee, J., "Spectral-Element Method for Levy-type Plates Subject to Dynamic Loads", Journal of Engineering and Mechanics, Vol. 125, pp. 243-247, (1999). Baz, A., "Spectral Finite-element Modeling of the Longitudinal Wave Propagation in Rods Treated with Active Constrained Layer Damping", Smart Material and Structures, Vol. 9, pp. 372-377, (2000). Lee, U., and Kim, J., "Dynamics of Elastic-Piezoelectric Two-layer Beams using Spectral Element Method", International Journal of Solids and Structures, Vol. 37, pp. 4403-4417, (2000). Lee, U., and Kim, J., "Spectral Element Modeling for the Beams Treated with Active Constraining Layer Damping", International Journal of Solids and Structures, Vol. 38, pp. 5679-5702, (2001). Wang, G., and Wereley, N.M., "Spectral Finite Element Analysis of Sandwich Beams with Passive Constrained Layer Damping", Journal of Vibration and Acoustics, Vol. 124, pp. 376-386. (2002). Mahapatra, D.R., and Gopalakrishnan, S., "A Spectral Finite Element Model for Analysis of Axial-flexural-shear Coupled Wave Propagation in Laminated Composite Beams", Computers and Structures, Vol. 59, pp. 67-88. (2003). Lee, U., and Lee, Ch., "Spectral Element Modeling for Extended Timoshenko Beams", Journal of Sound and Vibration, Vol. 319, pp. 993-1002, (2009). Lee, U., "Spectral ElementMethodinStructuralDynamics", John Wiley & Sons, Inc., New York, (2009). Cheung, Y.K., and Tham, L.G., "The Finite Strip Method", Boca Raton: CRC Press, (1997). Reddy, J.N., "Mechanics of Laminated Composite Plates and Shells", Boca Raton: CRC Press, (2004). Burden, R.L., and Faires, J.D., "Numerical Analysis", Boston: Pws-Kent Publishing Company, (1989). Bathe, J.N., "Finite Element Procedures", Englewood Cliffs, NJ: Prentice-Hall, (1996).